Driving through Sparta was no easy task. Cars were parking on every side of the road, pedestrians were popping out everywhere, crossing wherever they wanted. The small, bland town we were discovering sure had nothing to do with the image its name evoked. Not to say we were expecting heavily armed, half-naked, buff warriors to walk all over town and shout out that this was Sparta. Still, the place felt somehow disappointing in comparison to what we had made it out to be in our heads. Mystras, on the other hand, was everything we had expected it to be. Sparta was just a memory away when we saw a fortress sitting on top of a mountain. It had started to be a recurring sight throughout our trip in Greece but the fortress was not alone this time. On the green slopes of the mountain appeared the arcades of a church, and another one, followed by ruins of ancient dwellings, taking the shape of the bygone Byzantine city we were looking for. 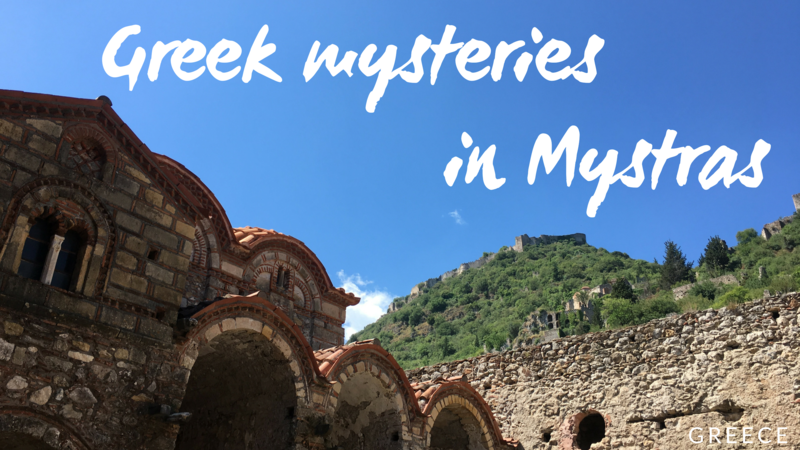 There was no mistake, we had found Mystras. Most cars were driving up but we decided to take the opposite course of action and to start from the bottom. Here we were now, walking on the well-preserved cobblestone paths of a ghost city, bringing it back to life for a time. The first church that appeared in front of us, the Metropolis, felt nothing like a remnant of a past long gone though. A bell was still ringing from its bell tower, chanting over a well-maintained, flowery courtyard where a cat was taking its nap. The frescos within the church were fading away, granted, but there was nothing dilapidated around us. Our next stop showed more signs of aging. Almost no visitor seemed to dare stray off the path to pay a visit to the Evangelistria, the rare ones who did only stopping for a better view on the Metropolis. Yet, there was something haunting about this church whose closed door let no outsider discover its hidden mysteries. Past the church was a path that tickled our curiosity even more and led us to the Pantanassa monastery, where we found out we had completely stopped following the logical visitor’s way. Logic wasn’t always travel’s best friend anyway. If getting lost and backtracking were the way to go to feel the place, then we were all for it. As we entered the Pantanassa monastery, a nun dressed in black walked across the courtyard carrying a basket full of cloth, too busy to do her daily chore to notice us. Just like the Metropolis, the monastery was neat but this one felt alive for good reason. 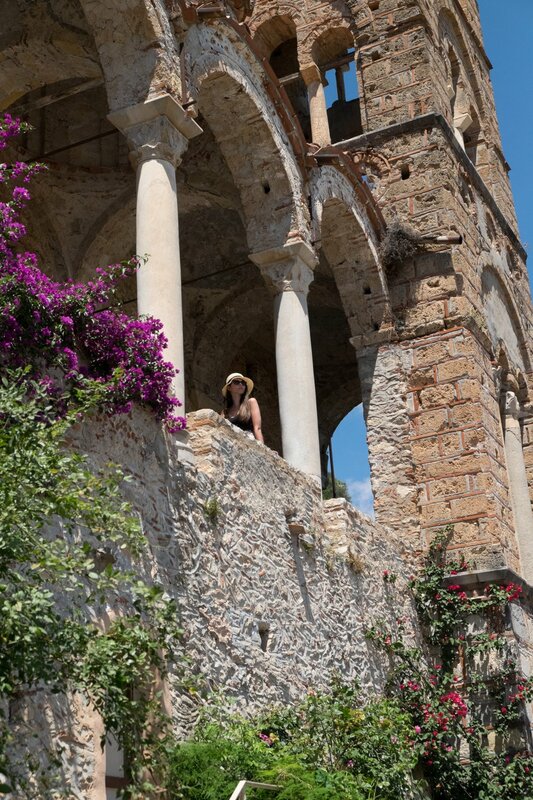 A community of nuns inhabited it, proving that Mystras was not just a sleeping town forgotten by time itself. Colourful flowerbeds and flower pots were all over the courtyard, turning it into the perfect playing spot for a number of kittens that had made themselves at home with the nuns. We would have welcomed taking some rest under the monastery’s arcades just like the kittens but still had a whole section of the city to explore. Contrary to what all paper guides had advised, we didn’t go back to our car and just continued climbing until we got to the upper city. The Palace of Despots, built by the Franks and expanded by the Byzantines, was closed for renovation so we moved on to the ruins of the church of Saint Nikolaos through a side passage and then to those of the Aya Sophia. Visitors weren’t as scarce now that we had gotten close to the upper entrance, pouring out of their cars parked nearby. The city was getting busier, noisier too, but the way up to the fortress got much quieter in an instant. The climb felt tough on our already tired legs, reminding them of the too many fortresses we had already climbed since we had arrived in Greece. As always though, the views on top were rewarding enough to numb the pain. The Byzantine buildings of Mystras were blending with the majesty of the mountainous countryside in the horizon. All that was missing was the sea to picture the perfect Greek postcard. On our way back, we once again took a detour to admire one of the churches we hadn’t seen so far, begging a last farewell to the magic of Mystras. Thirty minutes later, a block of feta and some tzatziki were completing the perfect Greek cliché and pumping us up for what would come next: Monemvasia. And its fortress.